Here at Tollymore we aim to provide a wide range of courses to cater for all levels. Generally, our courses are divided into categories, according to the environment in which the course takes place. Introductory courses tend to be in sections such as ‘Rambling and Hillwalking’ or Canoesport – ‘Flat Water’, and advanced courses tend to be in more challenging environments, such as Moderate and Rough Conditions for Canoesport, or Mountaineering and Climbing for mountain based courses. As you will see from our course list we run a large variety of mountaineering courses mainly based in the Mourne Mountains. This area offers fantastic rambling, walking and scrambling for everyone. We also run a number of courses in other parts of Ireland, UK and Europe. Our rambling and hillwalking courses are generally run on gentler mountain terrain, requiring only a basic level of fitness. These courses will introduce you to the simple skills necessary for safe and enjoyable travel on foot in this environment. The Centre is ideally situated within easy reach of a range of ideal locations, the River Bann possibly one of the best rivers around for introducing and developing white water skill. Strangford Lough and Carlingford lough for their outstanding natural beauty and ideal training grounds for getting to grips with tidal flows, developing basic skills among the shelter of dozens of islands and the opportunity to share the water with an abundance of birds, seals, otters etc which make Strangford Lough of world significance. On top of all this Tollymore staff hold the highest qualifications and are involved in training and coaching at the highest levels. When not on the water they are supporting the governing body in developing syllabi and developing schemes to increase participation. And of course when ever they can they are out there doing it for themselves. Of late our staff have paddled in Greenland, France, Italy, Sweden, the USA, Austria and of course all over the UK and Ireland. Guess what, this year will not be any different! If you do not get to meet them at the centre you are sure to see them on the water. Tollymore Paddle sport stores are fairly unique in that we carry a wide selection of equipment from all the main manufactures, so if you are interested in getting a medium size sea kayak at Tollymore you would have the opportunity to try a Romany, Shoreline, Pintail, Capella. If you are a larger paddler or looking for an expedition boat again we carry a full range. The advantage for you is that you get to paddle the best boat for you. 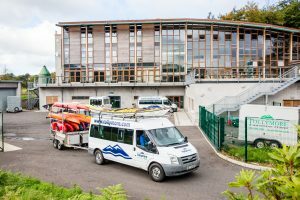 In order to deliver the best coach training courses, Tollymore staff work in partnership with the Canoe Association of Northern Ireland and have been involved in the development of syllabi and delivering Coach Educator training on behalf of the governing body. To complement the work of our staff we have invested heavily in resources giving those attending our Coach education, skills and leadership training courses the very best of resources from competition, creek, surf, sea boats and canoes, Paddling machines (Ergo’s), digital, still and video cameras, and of course a wide range of support material including books, DVD’s, charts, maps, handouts and presentations. Tollymore National Outdoor Centre runs a range of other courses aimed at providing groups and individuals with the opportunity to develop their skills at whatever level they choose, or to experience new activities for the first time. Browse our list of courses and if you cannot find the course that you are looking for, please contact us – if it is not on our list, we may be able to develop a course specific to your need. Tollymore National Outdoor Centre now has a purpose designed Mountain Bike Skills Course, which has been designed to allow bikers to develop their skills on a wide range of features. This Skills Course has approximately 1.5km of singletrack trail with a wide range of features, including rollers, berms, drop offs, table tops, rock sections, northshore, and log rolls. The Skills Course is open seven days a week, year round, from 9.30am – 5.00pm. From May – September, it is also open on Tuesday – Friday evenings until 9.00pm. The MBLA Trail Cycle Leader Award (TCL) is the first level of the scheme, and consists of a two day training course followed by a one day assessment. On public highways, way marked routes and legal rights of way on which cycles are permitted. On routes with low to medium technical demands. In terrain no more than 30 minutes walk away from shelter and communications and no more than 600 metres above sea-level. The MBLA Mountain Bike Leader Award (MBL) consists of an additional two days training plus a one day assessment. The qualification is aimed at leaders working with groups in more remote terrain, with a higher technical level. On routes with considerable technical demands. In terrain more than 30 minutes walk away from shelter and communications and all levels above sea-level. In addition to the core awards, there are a number of tag-on endorsements which may be held in conjunction with either level of the scheme. These enable leaders to widen their remit in specific areas of interest. Currently, Tollymore provides training and assessment in the night biking module. Other modules are available, such as expedition module and winter module. The MBLA Night-Biking Module is an additional module for qualified Trail Cycle Leaders and Mountain Bike Leaders to enable them to work in conditions outside the ‘daytime only’ remit of their award. The course deals with equipment choices and the extra demands in terms of group management, safety and navigation in this exciting area of off-road riding. The training consists of a 7 hour course spread over two nights or an afternoon and evening. For the module to be valid the candidate must then pass a three hour assessment.